Designed to work with all stages of hair loss within 18 to 26 20-minute treatments, the Theradome laser helmet is the first and only FDA cleared wearable over-the-counter laser hair growth treatment product. Developed, created and supported in Silicon Valley, the laser helmet provides thicker and more manageable hair, reduced hair loss and new hair growth to hair loss sufferers after three to four months and contains a diverse range of high tech features, including a master switch, built-in speaker, proximity sensors, soft rubber pegs, foam pads, battery and charging pins. Theradome’s clinical-strength restorative laser hair treatment increases blood flow to the scalp and hair follicles, stimulates microcirculation, improves cellular metabolism and protein synthesis, reduces the effects of protein blocking enzymes and promotes thickness and density, all in the comfort of your own home. The automated treatment counting system keeps track of all treatments and informs you, using voice technology, how many treatments you have undergone since you first began. Unprecedented in the laser hair treatment field, the Theradome laser helmet provides a 100 percent success rate. 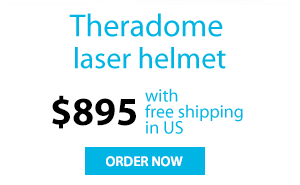 Not only is the helmet safe and easy to use, but Theradome provides you with thicker, healthier hair at only 895 dollars, a fraction of the usual cost, and a 120-day money-back guarantee. Schedule a consultation or simply contact one of our representatives today for more information about Theradome! Includes seven day full-refund return policy and one year manufacturer’s warranty that covers device malfunctions. Warranty does not cover device misuse or accidental damage. Extended three year warranty available. Cost of case not included. Replacement batteries available. Theradome is effective on 95% of hair loss. Tested to treat Androgenetic alopcecia. Your results may vary. Product does not work on Alopecia totalis (complete baldness). Theradome requires 15-45 minutes per session for 18-52 weeks. Is Theradome an InPatient or OutPatient Procedure? Theradome is mainly administered in your own home. What are the Side Effects of Theradome? There are no side effects with Theradome. How Long do Theradome results last? Theradome requires continued use to maintain results. Will my insurance company cover Theradome? Theradome is a cosmetic procedure and is not covered by insurance. What types of anesthesia is necessary for Theradome? There is no discomfort associated with Theradome. What else can I combine Theradome with? Theradome can be combine with Rogaine, Propecia, Dutastercide and other hair restoration medication. What else is Theradome referred to as?